Cheap (non-stop) flights from Italy to New York or Miami from €323! Major part of exotic Andaman Islands officialy belongs to India while minor part to Myanmar and its true paradise on Earth thanks to massive tourism has not discovered them yet. Have the opportunity to book cheap flights to Andaman Islands and experience its bone-white beaches and the unspoilt coral reefs fore some good snorkelling and diving! Thanks to our solution based on Air India you can visit icredible Andaman Islands from Europe during winter season 2017/2018 which is perfect time to tralve to this exotic destination. 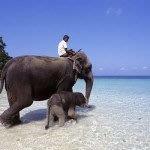 The cheapest flights to Andaman Islands (part of India) are now available already for £330 / €373! You need to look for open-jaw flights on route Milan to Port Blair returning to London. Flights may require You will find plenty of travel opportunities from January to March 2018. Max stay 6 months. Below you can refer to our booking samples..
Accomodation – during the main tourist season 2017/2018 you can book cheap accomodation in Andaman Islands already for £8/€9 for double room and night. To check your connection possibilities between Italy, Spain and London we recommend service of Skyscanner. This tool gives you quickly an idea which airlines are available from your home town. Want to fly to Indian mainland instead check out our previous post to New Delhi or Mumbai here. To further discount your accommodation in India consider serrvice of Agoda, Booking.com or Hotels.com. Booking sample of cheap open-jaw flights to tropical Andaman Islands from £330 / €373! As per travel samples in our above deal you would depart from Milan to Port Blair on Saturday, 20th of January. Your return flight from this exotic archipelago in Asia to London would be on 5th of February 2018. Want to enjoy some luxurious holidays in main tourist season for such an affordable price do not miss this deal..